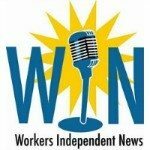 Workers Independent News Service producers gather news from labor unions and activists across the country. Their producers and reporters come from a diverse background encompassing all fields of media journalism, from print to radio, video to the Web. WIN shares one common goal: to create media that puts people over profits and shine a light on the conditions affecting working people.